This is a fun way to teach kids how to do chores around the house. This activity works great to teach kids how to do chores and let them practice in a fun way. 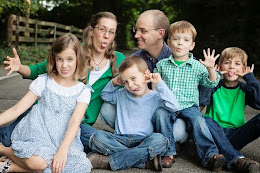 You can have kids compete against each other, or your family could invite another family to compete, or it can be used with a church youth group. I used this with the activity day girls in my church (ages 8-11). To begin your chorelympics, divide the kids into teams. Let them come up with their team name and color a flag. Play some music and have them march into the room and take their seats. With any of these chores, some kids will need instruction and practice before competing. You can either do training right before the event or have a separate training time. 1. Sweeping - Spread bits of paper around the room. Make a square out of tape on the floor. When you say "go" the kids will start to sweep their pieces of paper toward their square. First team to sweep their area clean wins. 2. Sock Matching - set out one laundry basket for each team. Spread single socks around the room. When you say "go" the kids try to match and fold the socks and get them in their basket. The team with the most matched and folded socks in their basket wins. 3. Table Washing - teach the kids how to scoop crumbs into their hand while washing a table instead of pushing them onto the floor in this game. Spread bits of paper on a table. Give a child a dry rag. Start a timer and see how quickly they can wipe all the bits of paper into their hand. Add penalty seconds for each piece of paper that falls on the floor. You can either have the team choose one child to participate or let each child have a turn and combine their scores for the final score. Whichever team has the lowest score wins! 4. Towel Folding - This can be a more creative competition. Choose music all the kids will know (I used "let it go") and give the teams a few minutes to work out their routines. The idea is to fold the towels while dancing. The girls had lots of fun with this one! They were tossing towels in the air and catching them while spinning and being very graceful. Kids will be judged based on how neatly the towels are folded and on their dance routine, just for fun. I let the kids who were uncomfortable dancing sit this one out and just cheer on their team. 5. Toy Sorting - You will need buckets and lots of toys on the ground. Assign each team a toy category (such as cars, dolls, blocks, etc . . .) then see which team can pick up their items and fill up their basket first. Or you can have one team go at a time and do all the categories, and just time how quickly they get things picked up. Add penalty seconds for things put in wrong baskets. 6. Bed Making - You will probably need to be home for this game. Teach the kids how to make the bed nicely, then see which team can do the best job in the shortest time. Bonus points for artful pillow arranging. 7. Table Setting - Teach the kids how to set a table. Set this up as a relay race. Each team has a box with items needed in it. (You will probably want to use plastic dinnerware). When the whistle blows, the first player grabs out the placemat, runs to put it on the table, then runs back and tags the next player who runs over to the table with the plate, and so on. Which team can get their place set first? This list is longer than what we did at activity days. I only got through 3 activities in the hour, but the girls had lots of fun. 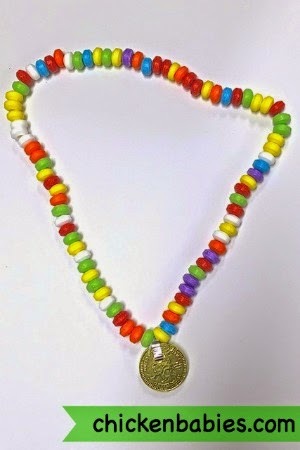 At the end they each received a gold medal made from a candy necklace with a chocolate gold coin taped on. You can make up games for chores you have your kids do around the house, such as mirror washing, toilet cleaning, mopping, etc . . . Once the Chorelympics are done you can continue the fun each chore day by checking their work and giving them a Chorelympic score and see which child rates the highest, or give your whole family a score and track your progress as a family to see if you can improve your house cleaning score from the week before. If you enjoyed this post, please sign up for my bi-monthly newsletter to receive more great ideas! 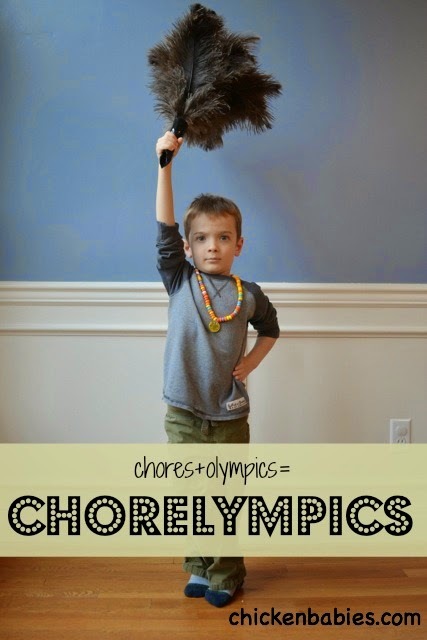 I'm going to do the chore olympics at activity days tomorrow night, these are such fun ideas.